(Bloomberg) -- The pieces are falling into place for a rally in emerging-market debt. After trailing behind equities this year, bonds are gaining momentum. 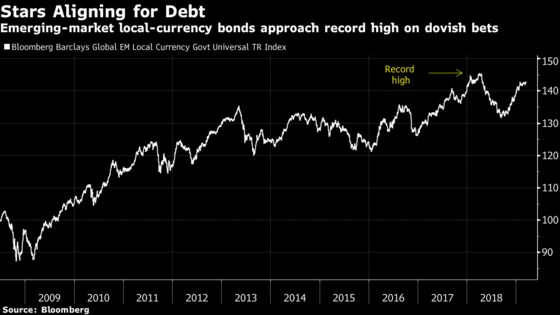 The Bloomberg Barclays emerging-market local-currency bond index is approaching the record high it reached almost a year ago. And while equity funds suffered their biggest weekly outflow since the second quarter of last year -- with a U.S.-China trade resolution probably still weeks away -- fixed-income funds are attracting “solid amounts of fresh money,” according to the most recent EPFR Global data. The brightening bond-market outlook shows how the weakest economic growth since the global financial crisis is boosting the case for the Federal Reserve’s dovish turn, limiting the dollar’s gains and allowing other central banks around the world to follow suit. The U.S. currency had its biggest weekly drop this year ahead of the Fed’s decision Wednesday, when policy makers may keep rates steady while signaling one more increase or none at all through the rest of 2019. Central banks in Indonesia, the Philippines, Thailand, Brazil, Colombia, Taiwan and Russia will also probably hold rates steady this week.